Martin Luther King, Jr had courage in bucket loads. The work he did for racial equality took so much love and bravery. After seeing The Help and sobbing through parts of it I was reminded once again what huge mountain he had to climb for what is right. As you go through today (maybe you're even off work- yay!) consider reflecting on your own courage. Is there a fear big or small that's keeping you from your authentic life? Facing your fears means looking at them honestly and taking it one step at a time. ANY fear can be overcome with truth, love and due diligence (spoken from a girl who's worked hard to face her fears and come out the other side). Speak truth. Be 100% honest with yourself and fill in any gaps with love. Love is the sweet filling that makes all things possible. Remember all the things that you've already accomplished. Sometimes in the face of a biggie you need only remember the things you've made it through before. For me it's always my big surgery, having my chin sewn to my chest for a very long week and IV after IV. If I can do that, I can do anything. It's climbing Olomana. It's the way I felt after hours of climbing that mountain and coming face-to-face with that huge final rock wall and getting to the top of it. Martin Luther King, Jr clearly had passion. If you don't know what your passion is that's ok. Start with the things in your life that are important to you. What would you be willing to stand up for? What gives your life meaning? I betcha you can instantly list off the people or little fur face loves that are important to you. You are mighty! I believe in you. May your courage envelop you and lead you to a very BIG life! 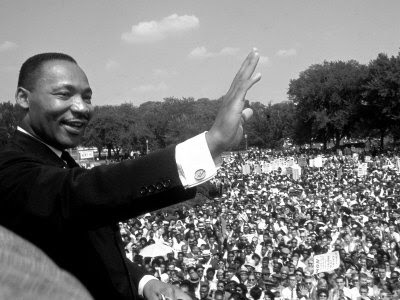 With love, with gratitude for Martin Luther King, Jr and all he endured, created and worked for.